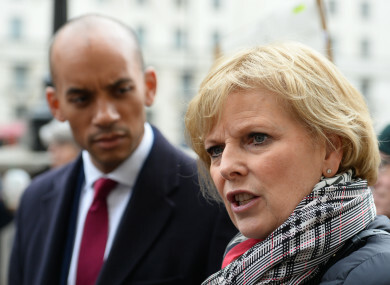 Independent Group MPs Anna Soubry and Chuka Umunna. BRITISH MP ANNA Soubry says that she can’t go home to her constituency this weekend because of the seriousness of Brexit related death threats that she has received. The Independent Group member revealed that the police told her husband that they are “frightened” for her safety. Soubry, who quit the Conservative Party last month, made the remarks a day after UK Prime Minister Theresa May criticised MPs for failing to implement the result of the Brexit referendum in a scathing TV statement. The politician took issue with May’s comments revealing that she was facing “very, very serious death threats, especially when people know your home address”. I can’t go home this weekend, I’m not able to go home this weekend, I am not safe. Soubry, who supports remaining in the EU, added that many other MPs have also received threats including her TIG colleague Chuka Umunna. We are tired of being called traitors. When people use that language the next thing that happens is that I get an email that says ‘Traitors get beheaded, that’s what should happen to you’. Several other MPs raised safety concerns following May’s comments. Labour MP Lloyd Russell-Moyle told Sky News that he was confronted on a street in his constituency. “When I said he was an MP he then started to get rather irate, called me a traitor, saying that I was one of the ones trying to stop the will of the people,” he said. He lunged for my face, grabbed my glasses then I grabbed his hand and pulled him close to me, one so he didn’t run away with my glasses and two so he couldn’t then hit me. In the days before the referendum in June 2016 Labour MP Jo Cox was murdered by Thomas Mair, a white supremacist. Speaking in Brussels tonight Theresa May declined to apologise for her comments but she did take a softer approach with MPs. “There are passionately held views on all sides of this argument. And yes, as I said, last night I expressed frustration but I know MPs are frustrated too,” she said. Email “British MP unable to go home because of death threats over Brexit”. Feedback on “British MP unable to go home because of death threats over Brexit”.